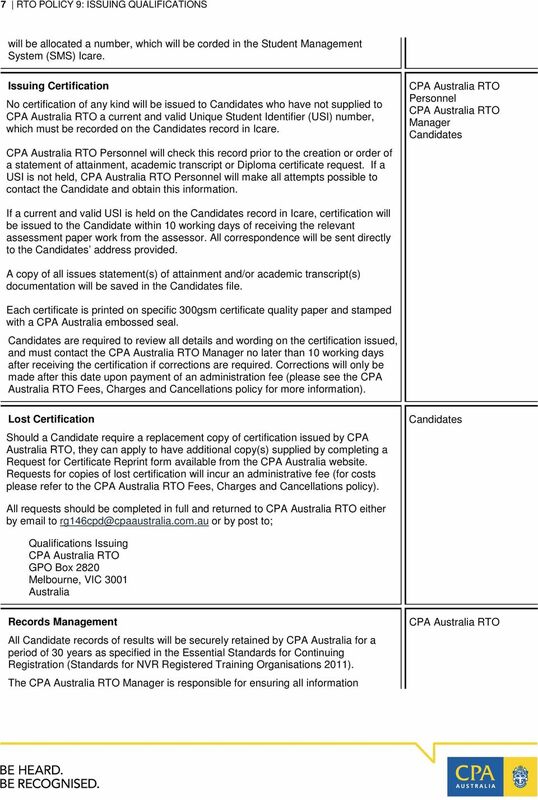 Download "RTO Policy 9: Issuing Qualifications"
2 2 RTO POLICY 9: ISSUING QUALIFICATIONS OWNERSHIP This policy is the responsibility of CPA Australia s Registered Training Organisation () working group ( Working Group). 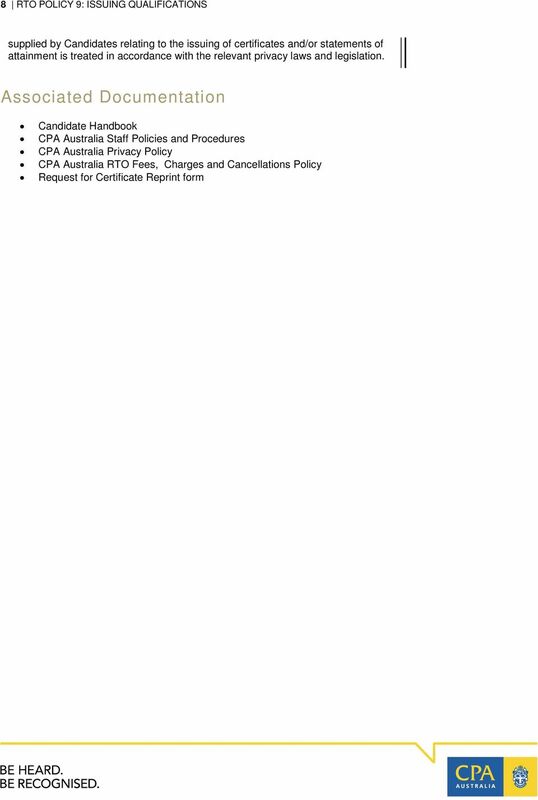 Scope CPA Australia Ltd (CPA Australia) has established this policy to support the Australian Skills Quality Authority (ASQA) Standards for Registered Training Organisations (RTO) The policy has been developed and implemented by the Working Group to support and provide clear instruction and guidance to program Candidates and Personnel. 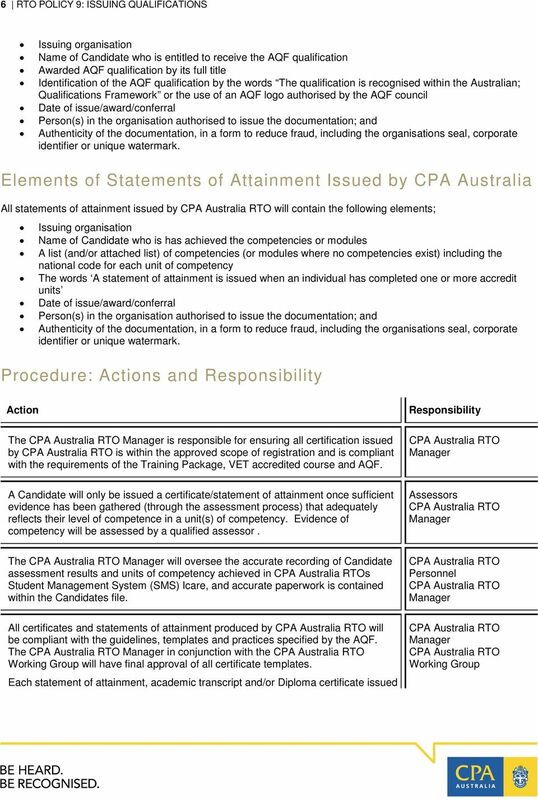 This policy applies to all nationally recognised qualifications and statements of attainment issued by CPA Australia s Registered Training Organisation under the Australian Qualifications Framework (AQF). 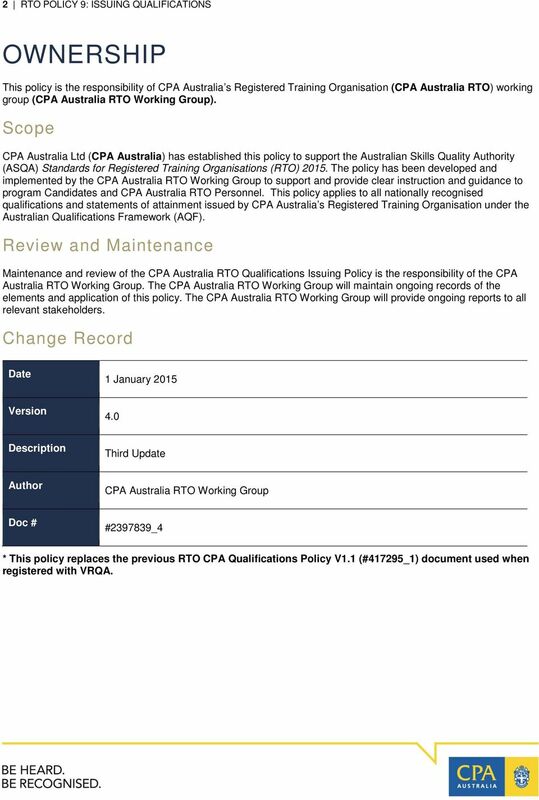 Review and Maintenance Maintenance and review of the Qualifications Issuing Policy is the responsibility of the CPA Australia RTO Working Group. The Working Group will maintain ongoing records of the elements and application of this policy. The Working Group will provide ongoing reports to all relevant stakeholders. 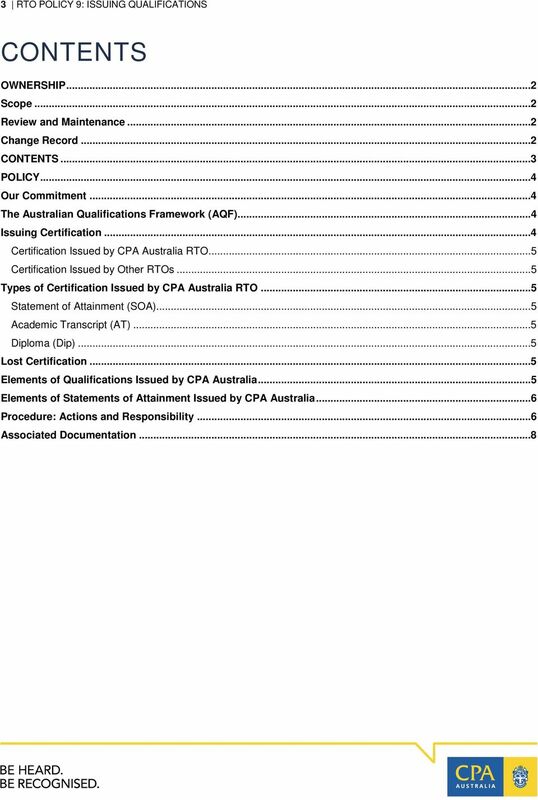 Change Record Date 1 January 2015 Version 4.0 Description Third Update Author Working Group Doc # # _4 * This policy replaces the previous RTO CPA Qualifications Policy V1.1 (#417295_1) document used when registered with VRQA. 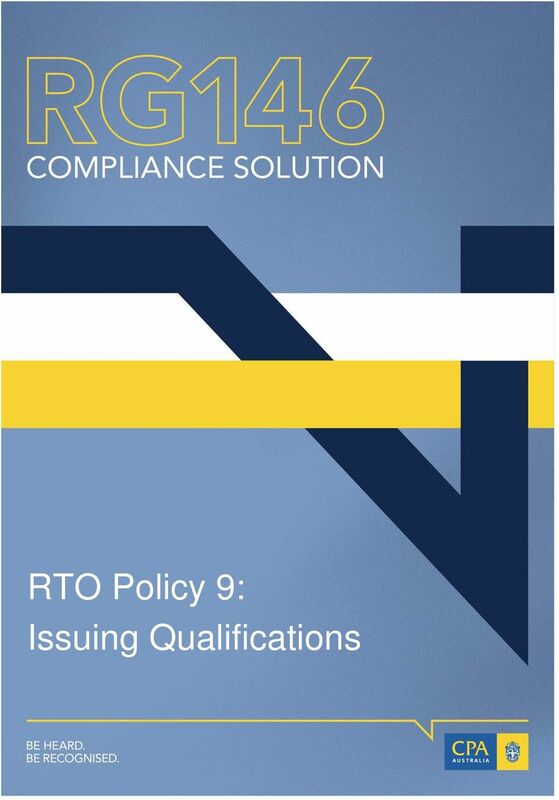 4 4 RTO POLICY 9: ISSUING QUALIFICATIONS POLICY Our Commitment is committed to operating in accordance with the practices defined by the Australian Qualifications Framework (AQF) relating to the issuing, recording and reporting of AQF qualifications, statements of attainment and related certification. will ensure all Candidates who undertake a program of study with the organisation, are issued the correct certification in a timely manner and in accordance with the requirements of the Training Package or VET accredited course. The Australian Qualifications Framework (AQF) The AQF provides a comprehensive, nationally consistent framework for all qualifications in post-compulsory education and training in Australia. In the vocational education and training (VET) sector it assists national consistency for all trainees, learners, employers and providers by enabling national recognition of qualifications and Statements of Attainment. 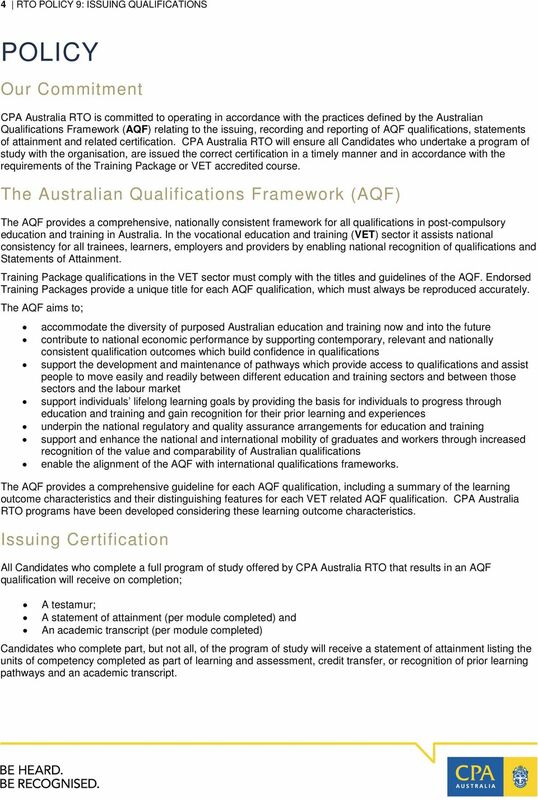 Training Package qualifications in the VET sector must comply with the titles and guidelines of the AQF. Endorsed Training Packages provide a unique title for each AQF qualification, which must always be reproduced accurately. The AQF aims to; accommodate the diversity of purposed Australian education and training now and into the future contribute to national economic performance by supporting contemporary, relevant and nationally consistent qualification outcomes which build confidence in qualifications support the development and maintenance of pathways which provide access to qualifications and assist people to move easily and readily between different education and training sectors and between those sectors and the labour market support individuals lifelong learning goals by providing the basis for individuals to progress through education and training and gain recognition for their prior learning and experiences underpin the national regulatory and quality assurance arrangements for education and training support and enhance the national and international mobility of graduates and workers through increased recognition of the value and comparability of Australian qualifications enable the alignment of the AQF with international qualifications frameworks. The AQF provides a comprehensive guideline for each AQF qualification, including a summary of the learning outcome characteristics and their distinguishing features for each VET related AQF qualification. 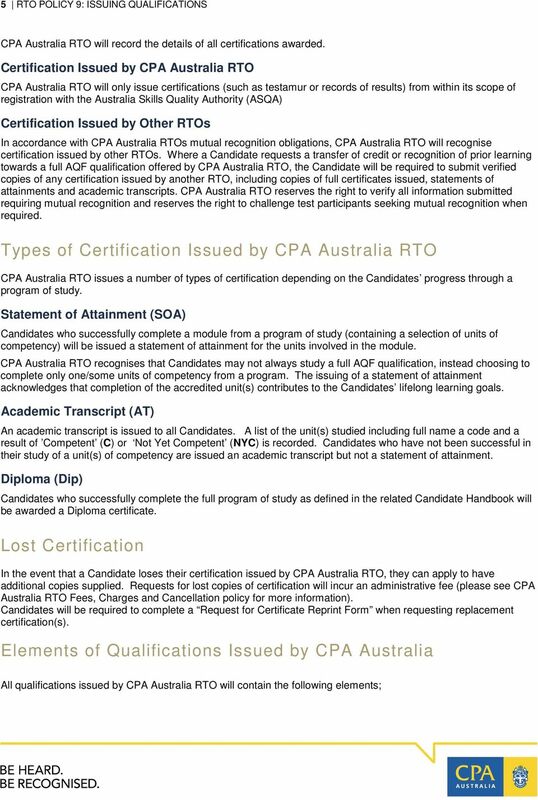 CPA Australia RTO programs have been developed considering these learning outcome characteristics. Issuing Certification All Candidates who complete a full program of study offered by that results in an AQF qualification will receive on completion; A testamur; A statement of attainment (per module completed) and An academic transcript (per module completed) Candidates who complete part, but not all, of the program of study will receive a statement of attainment listing the units of competency completed as part of learning and assessment, credit transfer, or recognition of prior learning pathways and an academic transcript. Change Record. Date 7 September 2015. Version 14.0. Description Thirteenth Update. Author CPA Australia RTO Working Group.